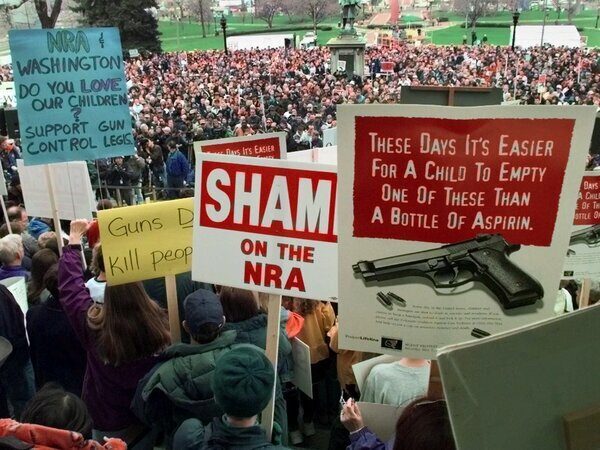 Demonstrators gathered on the Colorado State Capitol grounds in Denver on May 1, 1999, days after the Columbine High School shooting to protest the National Rifle Association’s annual meeting in Denver. On May 1, 1999, Tom Mauser stood with a protest sign, alongside thousands of others, at the National Rifle Association’s yearly convention in downtown Denver. It was a transformative day for Mauser. 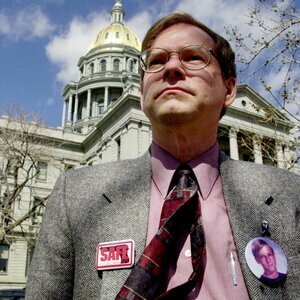 Just days earlier, his son Daniel was among the students killed at Columbine High School in Littleton, Colo. The convention was scheduled to begin just after the shocking April 20 mass shooting in which two students killed 13 before killing themselves. Denver Mayor Wellington Webb and others had asked the NRA not to come, but the convention took place anyway. According to reports at the time, the group held a moment of silence for the victims. Actor and activist Charlton Heston, NRA president at the time, told the crowd that there is “no more precious inheritance” than the Second Amendment. Mauser remembers that day as the point when he realized he was in the fight for gun control. For Mauser, too little has changed since Columbine. But the activism that has sprung up since the February shooting at Marjory Stoneman Douglas High School in Parkland, Fla., has given him hope. After the February shooting in Florida, administrators from Stoneman Douglas High School turned to Frank DeAngelis, Columbine’s retired principal, for advice on what to do next. Columbine survivors spoke out both in favor of and against the national gun debate reignited by Parkland. Darrell Scott, who lost his daughter at the Littleton school, was invited to the White House for a listening session on gun violence. And there were the new student activists. Mauser spoke at the March for Our Lives rally in Denver. The rally and the activism since the shooting at Stoneman Douglas High School feel like a watershed moment for Mauser. He works with Colorado Ceasefire, a gun violence prevention group created after Columbine. In 2000, they closed a loophole in state law that let people buy guns at gun shows without a background check. That is how shooters Dylan Klebold and Eric Harris got the weapons used at Columbine. Ben Gelt was a senior at Denver’s East High School at the time and was in philosophy class when news broke about Columbine. When Gelt’s mother, a Denver City Council member, told him the NRA would be in town, he helped plan the protest and got kids to join — before there was social media. He and a friend, David Winkler, organized a group of 100 students to travel to Washington to meet with President Bill Clinton later that year. Winkler spoke on national television from the White House. Even though Winkler and Gelt got national press attention and traveled across the U.S. to talk to students, Gelt said the activism after Parkland is larger and louder. Yet, not much has changed in the intervening years. Today’s Columbine High School students weren’t alive when the attack happened. But 16-year-old Rachel Hill and Kaylee Tyner say they grew up in its shadow. “This always affects all those students that go through that school after and everyone in the community,” Tyner said. The two current Columbine students are working with peers from Parkland to get young people to vote for tougher gun laws. Hill said their generation grew up with the active-shooter drills and lockdownsafter Columbine. For her, it’s not enough.